Personally the victory over England stands out for me because I have been on the receiving end of so many beatings from them. After that game momentum started to build and it became a season of firsts; first time to beat England, first Triple Crown against Scotland, a Championship and the ultimate glory of the Grand Slam. France stood in our way, however strong forward play saw us victorious on the night. And then onto Milan. To say playing conditions were tough is an understatement. It had everything you didn’t want to play a game in. Covered in mud, hands frozen, playing a dogged Italian team, it took all our reserves to seal the victory, but that we did. The pride and honour of lifting the trophy on behalf of my team-mates and management is an unforgettable moment. I have been asked many times “what was the difference this year?” but success like this doesn’t happen overnight. Years of hard work, time, effort and commitment made this possible. This success is due credit to anyone that has ever been involved in Irish Women’s Rugby. We arrived back to Dublin Airport amidst a whirlwind of media attention and support. We were overwhelmed with the way the public embraced us on our journey. This was how things continued on for the year; lots of interviews, invitations to events and nominations for awards. An annual favourite event of mine is the Irish Times Irish Sports Council Sportswoman of the Year Awards. Having attended the last couple of years, I was delighted that we once again got a nomination. This award ceremony highlights the immense talent we have amongst Irish Sportswomen and it is an honour to be nominated alongside the likes of Fionnuala Britton, Katie Taylor, Annalise Murphy and every other deserving monthly winner. Having secured the Grand Slam, I suppose our chances of winning had improved, however, looking around the room, I was once again in awe of the monthly winners. When my name was announced I was in complete shock and ended up hugging my coach and ignoring my poor parents beside me. I was truly humbled to accept this on behalf of the team. Unfortunately sport doesn’t wait for anyone and we were back in Ireland camp immediately after Christmas to prepare for the year ahead. First up we have the Six Nations to defend our title. Last year’s victory counts for nothing now and we face two very difficult away games in England and France, places we have never won before. I would also expect Wales and Italy to travel over here confident in their ability to beat us. Following this we have the World Cup in France in August. With New Zealand drawn in our group, we are truly pitting ourselves against the best in the world but we are excited to get to play them for the first time. We are currently ranked 7th in the world but we will be pushing hard to make the semifinals, and after that anything is possible. 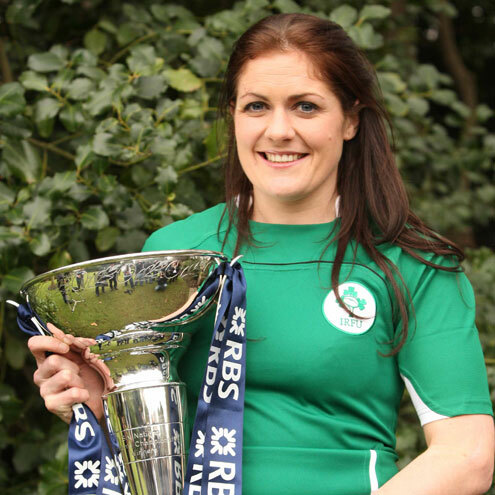 Whilst 2013 has been unforgettable, we hope to make 2014 equally as memorable for Irish Women’s Rugby.